Hello! In this post, you will learn to send HTML content inside an e-mail body. In PHP, you can achieve this in many ways. Below two are commonly used. In the first one, you need to have a properly configured SMTP server of your own, since using Gmail like service provider’s server you will be asked to handle various authentication stuff. So here, I will show you how to use PHPMailer library to send mail using Gmail’s SMTP server. Let’s start. For this you can refer to our blog post Send email via Gmail SMTP server in PHP which will give you a clear idea about the settings you need to change in gmail and how you can use PHPMailer Library. The library is written in PHP and includes PHP class files.You can download from Github. Now extract PHPMailer’s .zip file, to your project folder.I had given the path as “/script/phpmailer/”. Copy-paste the downloaded php_smtp.dll file in the “C:wampbinphpphp5.2.6ext” folder. 4. Make sure to enable the extensions. Now Append below code of PHPMailer, which handles the mailing part, to this file . It is the html code you want to send inside an email. Remember to use inline CSS only,since many email service provider don’t support external/internal CSS. Now save the file and execute. 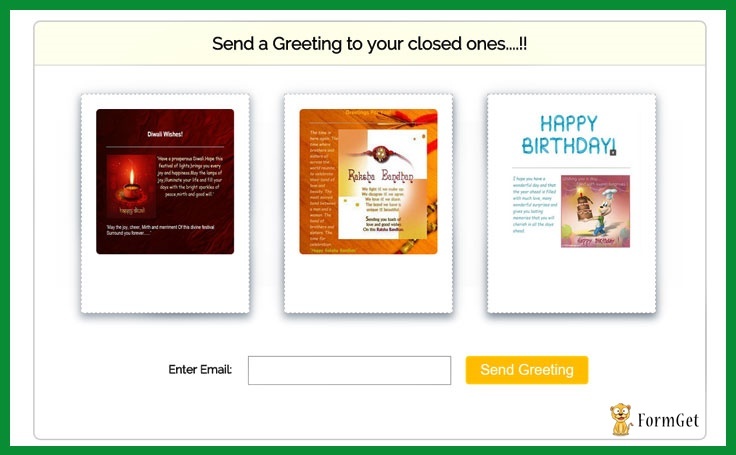 You can create your own customized HTML template for email or you can use an Email Builder Tool to create responsive email templates. When the program executes, an interface will be displayed which contains the HTML templates to select and a form which will ask for an email address to send the element. To determine which template is selected by the user, the value of checked radio button is also supplied with the form data. Now on submission of the form, email-id and value of radio button will be captured by mailer code and using ‘if ($_POST[‘greet_radio’] == ‘value’) ,the selected template will be sent to provided email id. I hope that at this point you must be feeling yourself comfortable with sending HTML inside email body. You can also try sending mail using other SMTP servers. Please comment for any query. Keep visiting our website.